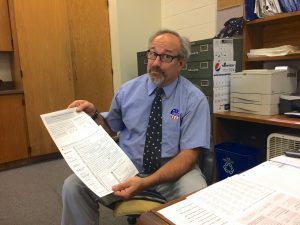 OGDENSBURG, N.Y. — Some high-school students are voting in this year’s election as part of their schoolwork — and what they consider to be their civic duty. At Ogdensburg Free Academy, about 80 senior students participated in registration drives to get residents to sign up to vote. They also studied both parties and signed up for one of them, all as part of one teacher’s push to combat student apathy in an often-nasty campaign. Snyder, who has taught at the high school for 30 years, gives extra grades for the students to cover the presidential and vice-presidential debates. Some of the older students can receive extra credit if they go out and vote. Grade 12 student Matthew Robinson says the course has made him more engaged in politics. “I usually just look at the stuff people are posting online, for example on Twitter,” says Robinson, who planned to vote with his grandparents after school. James Gibson, another senior student, says his parents have always been very involved in politics and the news. That, in turn, has made him very engaged in his first election. “My family’s big into politics, so I’ve always been around it,” says Gibson. He said that he has been more involved in this year’s election than in previous years. Not all students take after their parents’ political involvement, however. Student Dedan Graveline, is very involved in the news, though his parents are not. Student Anthoni Pope echoes the sentiment, saying he thinks voting should be a priority.